Only 150 metres from the nearest beach, the traditionally built Agios Nikitas hotel is located in a stone-paved courtyard with bougainvillea and jasmines. A snack bar with inside and outside area is provided for breakfast and refreshing drinks. Set within lush gardens 250 metres from the beach of Lygia in Lefkada, Konaki Hotel offers free Wi-Fi, a traditional restaurant and a buffet breakfast. 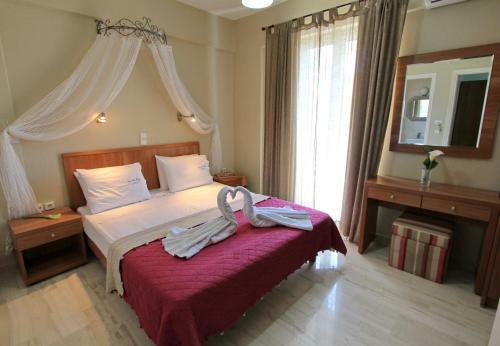 Rooms feature private balconies overlooking the olive groves or the swimming pool. Just 80 metres from the sea, between the famous beaches of Porto Katsiki and Agiofili, Vassiliki Bay offers an outdoor pool with 3-seat hot tub, and rooms with village or mountain views. With a panoramic view over the valley of Rachi and Amvrakikos Gulf, Hotel Irida is only 2 km from Lefkada Town. The family-run hotel offers self-catered accommodation with private balconies or terraces. Within 250 metres from the beach and 1 km from the popular town of Nydri, Poseidonio A has a swimming pool with poolside bar overlooking the Ionian Sea. Its air-conditioned rooms enjoy sea or pool views.